Isn’t it everyone’s favorite subject? Oh come on, it isn’t that bad! I would like to boldly announce that I now almost kind of like math. It’s not love, but I definitely no longer hate it. After teaching math in our homeschool for the past 6 years, I have changed my mind. And I’ve also changed how I approach math. 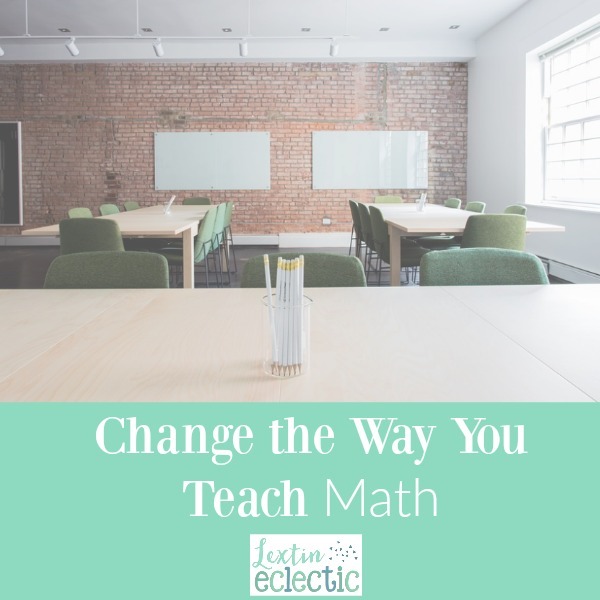 Hang in there with me while I share why you should throw out your old notions of teaching math. The way you and I learned math – just no. There is a much better method! You shouldn’t start with teaching numbers. Is one of your early education goals to teach your kids to count to 10 or 20 or even a hundred? Are you trying to teach your kids number recognition as the foundation of your math program? I’m going to show you why you should consider a different route when teaching math to your young child. In talking with a friend who is a kindergarten teacher in a public school (and a totally awesome one, by the way), she told me that the major goal in kindergarten is to get kids to count all the way to 100. And then I had a friend ask me some questions about teaching math. She told me that a friend of hers focuses the preschool years on teaching number recognition. Let me tell you why I disagree with both of these approaches to math. In each of these math approaches, the focus is on numerical symbols – teaching counting by number or teaching number recognition. Go ahead and think about how you learned math. You learned to write down numbers and symbols on paper and then calculate the answers. You also learned how to count and say the numbers aloud. Do you know the problem with these methods? You aren’t teaching the meaning behind those symbols. You are teaching abstract concepts before teaching a concrete meaning behind them. Young children live in the world of concrete objects. They learn by seeing, touching, and doing. Their brains don’t process abstract concepts well. This is why you absolutely must change your approach to teaching math. Start with the concrete concepts first – teach the meaning behind the symbols. In this video I walk through each of my examples of how to make math concepts concrete for young learners. Teach what each number means. Demonstrate 3 by showing 3 items of various objects. Compare 3 objects to 5 objects so children can understand the difference between the numbers and start to learn the concepts of greater than and less than. Don’t do any written math work in the beginning (or only very little). In other words, don’t worry if your child can’t correctly write any of the numbers in the beginning. Do most math orally and with manipulatives, using concrete objects to show numbers. Count the math way – 10 is one-ten, 11 is one-ten-one, 23 is two-ten-three. It might sound a little crazy at first but this teaches kids to understand the value of each number and not just memorize a list of words in order. Use an abacus to demonstrate number relationships. Kids need to learn to count while looking at numbers and number relationships. An abacus is the perfect way to demonstrate the meaning of each number. Make it visual and kinesthetic. Kids need to be able to touch and interact with the numbers in order to grasp the meaning behind each one. Don’t emphasize counting. Instead, focus on teaching kids to recognize what a group of 3 objects looks like or a group of 5 objects. Show place value by teaching the meaning of place value using objects to represent each place. I do this with place value cards that have a picture of a block for the ones, a picture of a stick of 10 blocks for a ten, a picture of a square with 100 blocks, and a picture of a cube of 1000 blocks. When teaching math, you need to have a huge paradigm shift. It’s not about teaching the numerical symbols or having kids to rattle off meaningless numbers in order. Teaching math is about creating number sense and showing the meaning and value of each number. Focus only on the concrete concepts of math. Kids will easily learn to recognize and write numbers after they have mastered the meaning behind them. Once kids have learned the meaning behind the math, they will be amazing problem-solvers because they were given a solid math foundation. They will have learned a very illusive concept – the WHY behind the math that they do. Let me share a quick story that will help you see why this method of teaching math works so well. This illustration shows how teaching concrete concepts in early elementary can help kids move to abstract thinking toward the end of elementary school. My oldest has struggled in math (she’s definitely my child). However, she has done well in math the past few years and has gained an excellent understanding of math concepts – and let’s be honest, I have too. We were working on a lesson about finding the measurement of the interior angle of various polygons. Neither one of us could figure out what to do. We were completely stumped. My daughter got very frustrated with me and stormed out the room to work on her math alone. She came back to my room 30 minutes later and put her paper in front of me. She had correctly solved the all of the problems on her assignment and even derived a formula for being able to find the interior angle of any polygon. Hooray! This is my math goal now realized! My daughter didn’t learn a bunch of meaningless symbols and formulas. She learned the how and why behind math concepts. Now, she derives the formulas herself because she has an excellent math foundation. This is the key to math success! Foreign languages can be challenging to teach! I try to add in DVD learning and songs to enhance our learning experience. But yes, those subjects are hard at times! As a math teacher (high school) I love everything about this. Math in my opinion should be about teaching transferable problem solving skills. Great great post! Well done! Thanks! Math should be so much more than just teaching a formula – I try to teach to understanding. I want my kids to have those problem solving skills! Yessssss. This is amazing. As a special education teacher, I wholeheartedly agree with this method. Hands-on learning is amazing for younger kids and kids who need a little extra help. It has made all the difference in helping my kids understand math! Your examples are exactly how I tutor kids with math. Letting them be hands on is the best way of learning for any subject. As an elementary teacher and a mom, I completely agree! One thing that I have found with my second, third, and fourth grade students is that the lack any kind of number sense. They simply memorized numbers and facts, but could not problem solve or explain their thinking. When teaching my toddler, I applied your exact method. Not five minutes ago, I gave her a blue piece of construction paper and some butterfly cut outs. I asked her to show me various numbers of butterflies. Sometimes she counted them out, sometimes she could simply grab a stack of butterflies, look at them, and say, “I know that is a group of 3.” I was able to add on by asking her to show me one more or one less and she could explain that “more” is adding on and “less” is taking away. I mean, does this method not make sense! Thank you so much for sharing! I hope teacher and parents alike get on board! Thanks for sharing about your experience. I definitely worried that my kids would not have good number sense, so I searched for a program that I thought would really help with that. I think it’s so important to teach grouping and to make math very hands on and visual. This is so interesting! My husband was a math teacher and he agrees with what you write here. I have 5 kids and one loves math and 2 really hate math and the other 2 think it is just ok. I also think we are wired differently to learn math concepts. I have kids who love math and some who really dislike it and another who doesn’t really seem to care. lol. It’s funny how different they are! And I think that no matter how they learn math, teaching it in a hands-on way really makes a big difference! It helps any type of learner.